I have pretty terrible vision. Without corrective lenses, I can barely see past the end of my nose. I am also susceptible to motion sickness, particularly when I switch between contacts and glasses. If you don't switch between the two, you may not be aware that glasses can actually distort your vision. After wearing glasses for a little while, your brain gets used to it, and it doesn't look distorted anymore. But when I take out my contacts (little distortion) and put on my glasses (more distortion), my brain doesn't handle the change well and interprets the difference as motion. The result: near-instant seasickness.1 I find that I can choose glasses or contacts in the morning and have to stick with that choice for the rest of the day. With contacts, I actually have peripheral vision, I can wear regular sunglasses and goggles, and I don't have to worry about fogging and smudges, so contacts are my preference. Every chemistry department I have studied or worked at has banned the use of contact lenses in teaching and research labs, however. Some lab doors even have signs trumpeting this policy, but lab safety rule sheets and lists of guidelines don't often provide a lot of reasoning for the ban. In my experience, two major reasons are given: contact lenses can adsorb/absorb vapors, and when liquids or solvents are spilled, they can get between the lens and the eyeball, preventing proper flushing and extending the exposure time. I've heard several horror stories about combinations of chemicals and contact lenses,2 but they have largely struck me as urban legends. I've long wondered: is all the caution necessary? Do I really need to wear my glasses in lab? A quick (and hardly exhaustive) Google search for chem safety guidelines showed many contact lens bans in place across the US, so I asked around on Twitter for thoughts about contact lens use and bans. Marcel Swart and Sven Kochmann were suprised to hear that contacts were banned in labs and noted the advantages contacts can have over glasses. David Nelson's lab discourages contact lens use (though he later found that official university policy bans them). His university offers cheap prescription safety glasses, as did the University of Michigan, when I was a grad student there. @bad__scientist shared a story of the difficulty removing contact lenses once a spill/splash in the eye has occurred. @chemjobber found the National Institute for Occupational Safety and Health (NIOSH) report on contact lenses in the chemistry lab, which I had come across when pondering this questions before. @JChemHealthSafe reported in on some of the history of the NISOH report. Meanwhile, Beth Bosley's lab actually follows the NIOSH guidelines. "Injury data are lacking to indicate that contact lens wear should be restricted during work with hazardous chemicals, and thus NIOSH recommends that contact lens wear be permitted provided that the safety guidelines presented in this Current Intelligence Bulletin (CIB) are followed." 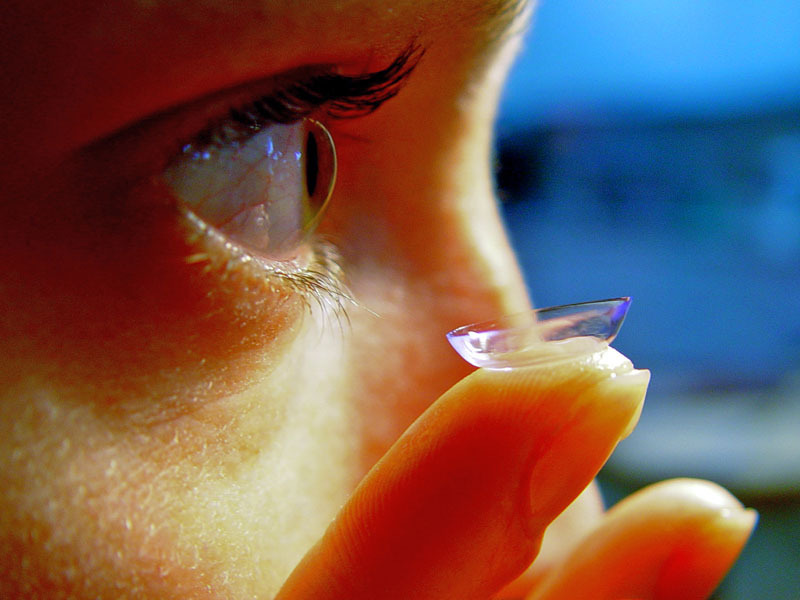 The report concludes: "Wearing contact lenses does not appear to require enhanced eye and face protection." There are a few exceptions, however: an in vitro study "indicates that isopropyl and ethyl alcohol may pose risks to exposed workers wearing contact lenses [Cerulli et al. 1985]. "4 Additionally, the US Occupational Safety and Health Administration (OSHA) "recommends against contact lens use when working with acrylonitrile, methylene chloride, 1,2 dibromo-3-chloropropane, ethylene oxide, and methylene dianiline." University chemistry departments want their students to be safe and they create safety policies in an abundance of caution. As I said on Twitter, though, caution is a fine thing, but safety rules should be based on evidence. Given the lack of evidence in support of a ban on contact lenses, the NIOSH guidelines that recommend allowing contact lenses, and the practical difficulties of enforcing a contact lens ban, I think it's time for universities to update their policies. What do you think? Am I overlooking an important risk? Are chemistry departments just slow to change? I'd love to hear your thoughts. A PDF of the NIOSH report, including the full list of references, can be found here. 3: Note that these studies did not consider the impact of using personal protective equipment (PPE, e.g. goggles, face shields). 4: Ethyl alcohol, also known as ethanol, is the stuff that non-chemists mean when they say "alcohol," which leads me to wonder if contact-lens-wearing bartenders should be wearing eye protection in case of a spill!